Um…you guys? I have something to tell you. Don’t get mad ‘kay? I started another DIY project. Well, we started another DIY project. I conned bribed Hector into helping me put wainscoting on our formal dining room walls. He has taken a few days of R&R after getting back from his latest deployment. So, I figured, “HEY! What better time to renovate the dining room than when you’re relaxing? !” Wife of the Year Award just slipped beyond my reach. No matter. 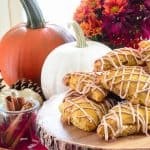 Bribery is still a great concept, and these White Chocolate Pumpkin Scones with Cream Cheese Cinnamon-Maple Glaze made him über-compliant to my request. We’re wainscoting the HELL outta that dining room, y’all! Hopefully, you remember my disdain for white chocolate. You may also remember that Soldier-Boy loves himself some white chocolate. Hector loves pumpkin, which I’m also not a fan of. These scones were created and baked with Hector in mind, obviously. Surprisingly enough, though, I found them to be delicious in spite of my aversions. The pumpkin flavor was prominent, but not overwhelming; and the white chocolate chips melted and crisped to become a crunchy, buttery candy. The cream cheese base cinnamon-maple glaze was literally (and figuratively) the icing on top. 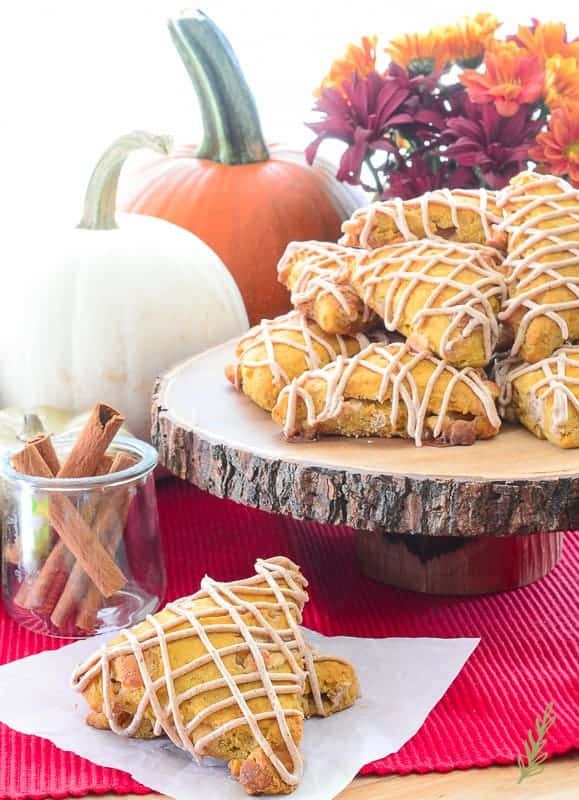 These white chocolate pumpkin scones are definitely worthy of repeat appearances in my kitchen. I love to roast and puree bulk amounts of pumpkin when they’re in season. I read an article once that revealed an investigation into canned pumpkin- because, you know people actually investigate canned pumpkin for a living. Anywho, the in-depth investigation revealed that most canned pumpkin isn’t, in fact, pumpkin at all. It’s squash!! WHAT!?!? I know! I was devastated too (not really)! It just solidified my conviction that you only know where your food comes from if you get it in its rawest form. ALL that said, I used canned “pumpkin” this go-round. Wainscoting, remember? I don’t have frozen pureed pumpkin, or enough sanity to make that happen this week; so, canned it is. My husband has just come from a place where “fossilized chicken” is a thing. He’ll be alright. Scones are definitely one of my favorite breakfast breads. They’re [often] a sweeter version of the biscuit. Scones and biscuits are prepared in the same way; I just refuse to yield to peer pressure and cut mine differently. I believe in using as much of my scone/biscuit dough in the first cut. The more you handle and re-roll this type of dough, the less flakier the end result will be. That’s sad. When you cut your scones into round circles, you lose so much precious dough in your first cut. The second cut yields less impressive scones, and God forbid you go a third round. You may as well suit up in your hockey gear. I cut mine into triangles! It may not be the European way, but I celebrate the Fourth of July for a reason. The scones begin with a mixture of dry ingredients. All-purpose flour replaces my standard cake-all purpose blend because of the added liquid from the pureed pumpkin. The flour is whisked together with a leavening agent (baking powder), salt, and my Pumpkin Spice Blend. Another odd step is placing the flour mixture into the fridge to stay cold. The key to fluffy scones (and biscuits) is making sure all of your ingredients stay cold for as long as possible. When those cold ingredients are hit with that blast of heat from your oven, the liquid in the dough evaporates so fast it leaves layers of flaky, buttery bread! I get excited just thinking of it. 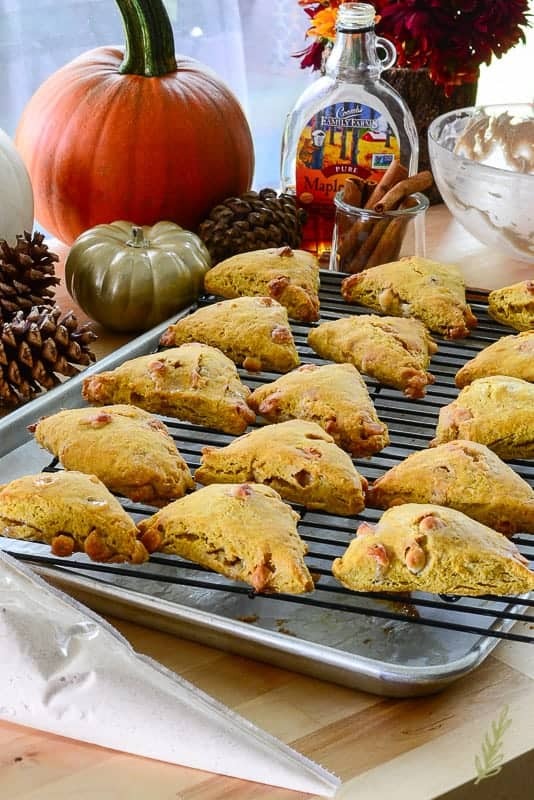 Since we’re adding the pumpkin, our scones won’t be extremely flaky, but they’ll have enough to satisfy you- promise! Once the dry ingredients are combined, I get to work on mixing the wet ingredients in a separate bowl. 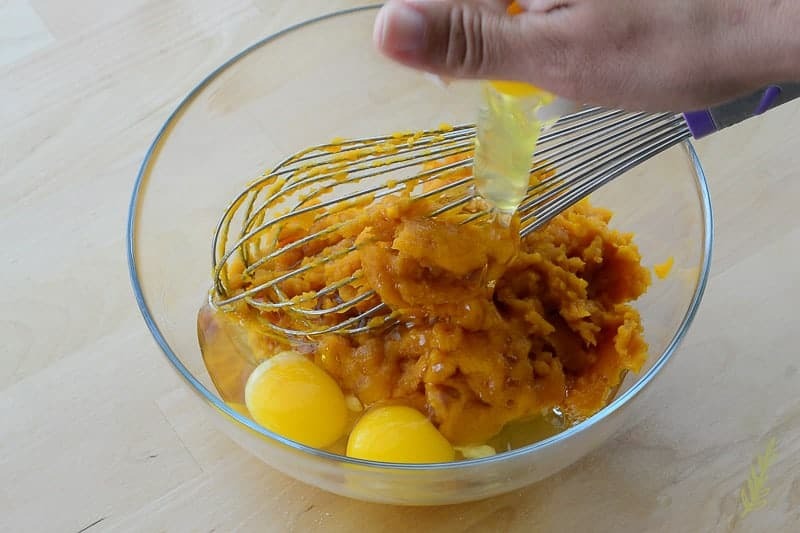 Whisk together the pureed pumpkin, cream, and eggs using the same whisk you used to combine the dry ingredients. You may have wainscoting to finish too, so I’m saving you time. Set that aside in the fridge to keep cold because we have some “buttah” to deal with. Unlike most of my baked goods, this recipe calls for us to use butter that is stone-cold. Leave your butter in the fridge right up until you need to dice it into minuscule little pieces. Now, we add the pumpkin puree mixture to the flour mix and fold gently. 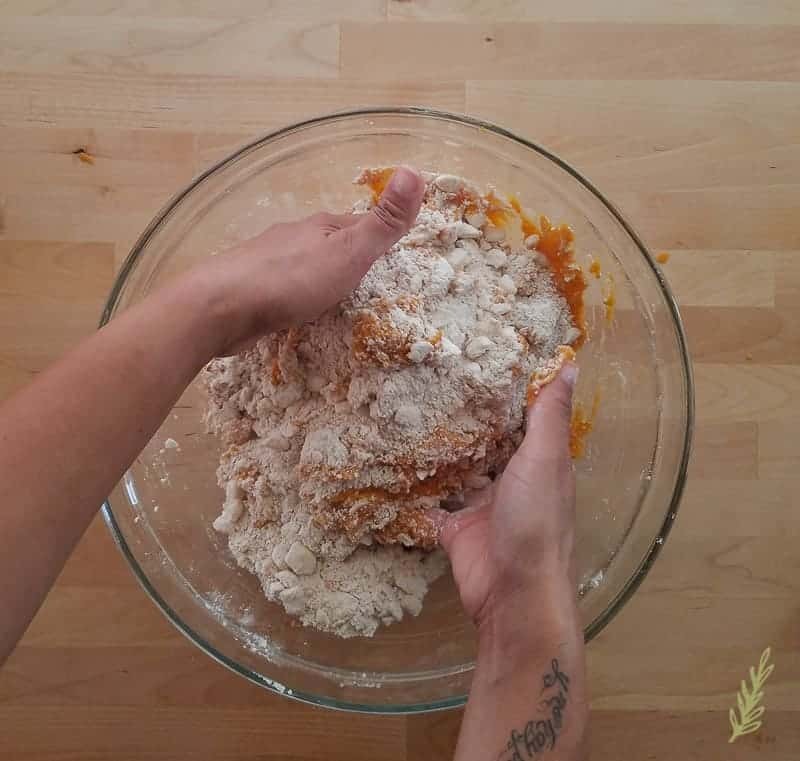 The goal is to mix just until it binds together into a loose dough. It’ll be sticky because of the pumpkin, but we have to love it without judgement. 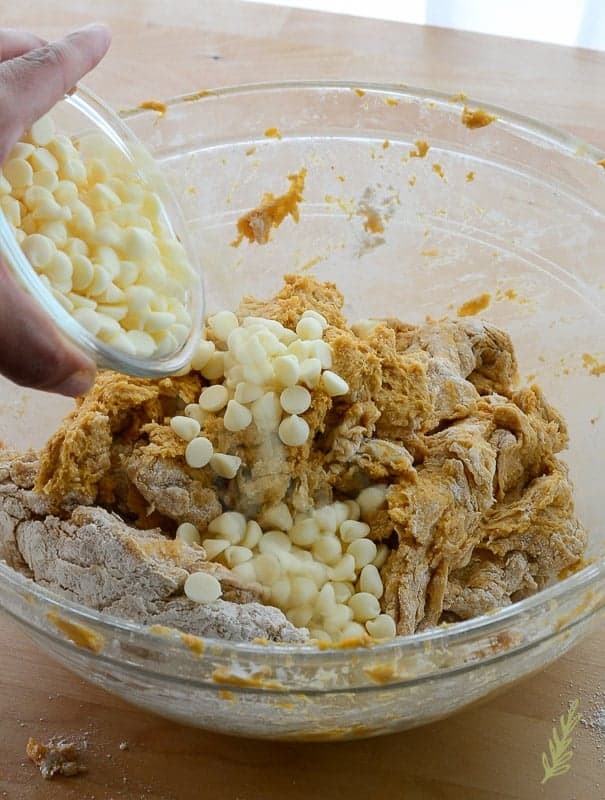 Add the white chocolate chips. Always choose the highest-quality chocolate you can afford. Bad chocolate is like a bad relationship- it leaves a bitter taste in your mouth. Gently fold those in as well, then generously flour your countertop. 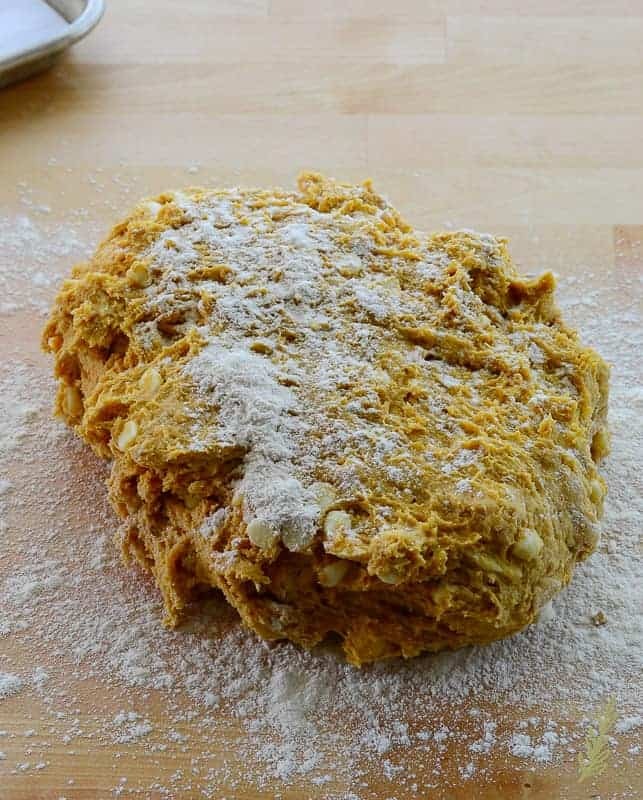 Dump your scone dough onto the floured surface and roll out into a rectangle that’s about 9″x13″x1/2″ thick using your rolling pin. 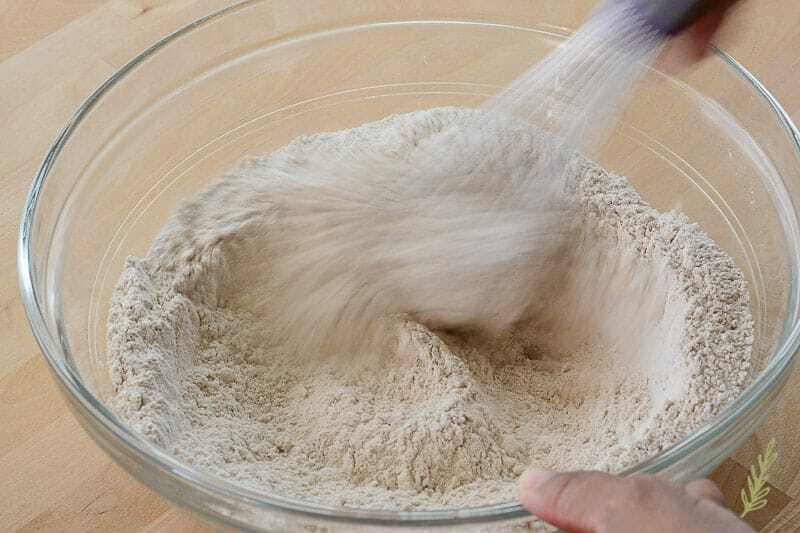 If your dough begins to stick to your rolling pin or your countertop, dust either with a bit more flour. Try to avoid adding too much flour, though, as it will only burn when we bake the scones. Cut your rectangle into thirds lengthwise using a bench scraper, or a very sharp knife. You want to avoid sawing at the dough because that will seal the edges and inhibit rising. A quick down and up cut is best for the flakiness we want so much. Now, cut your thirds into triangles of equal size. I was able to get 15 out of mine, but, normally, I can squeeze out a dozen and a half. I had a Soldier to appease so I cut these a little larger. You can also opt to cut them in mini sizes for brunches or potlucks. Place the sheet pan into your preheated oven and bake. 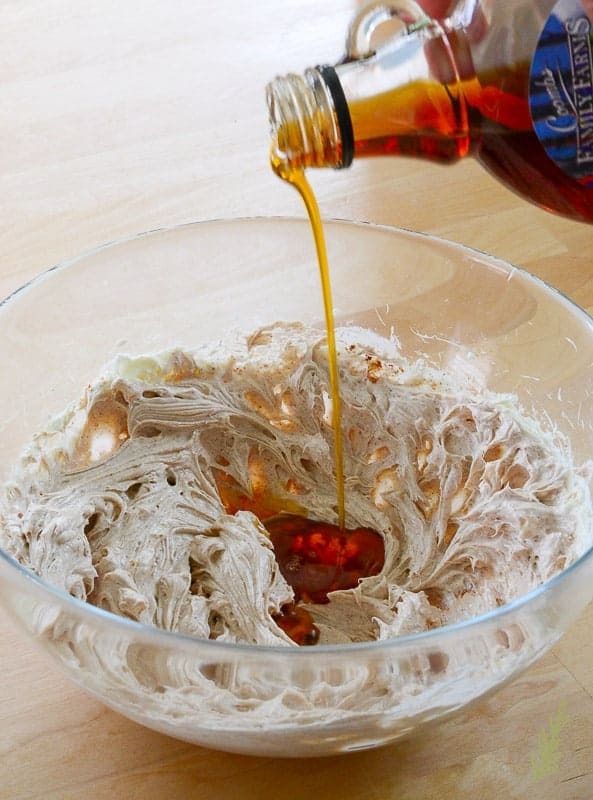 While the scones are baking, prepare your Cream Cheese Cinnamon-Maple Glaze- that’s a mouthful! 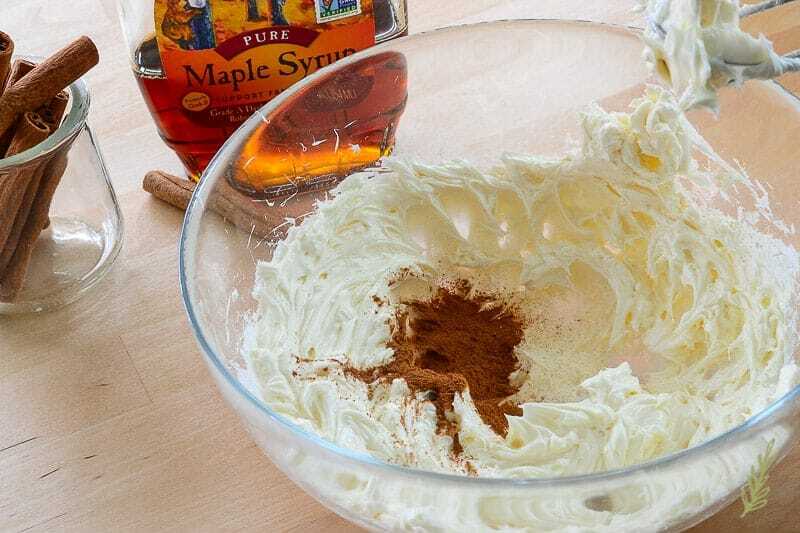 In a medium size mixing bowl, whip up an 8 oz brick of softened cream cheese, a pinch of kosher salt, and a heaping tablespoonful of ground cinnamon. Whip in the maple syrup and confectioner’s sugar to sweeten, and set aside until ready to pipe. 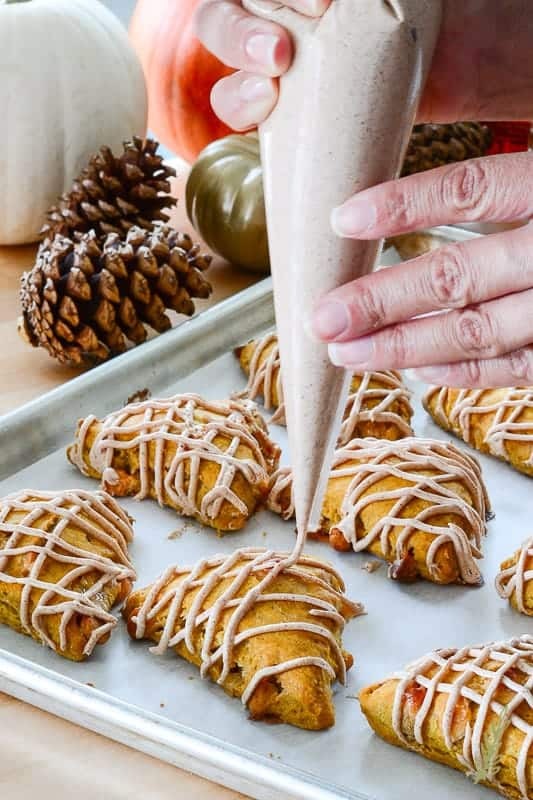 Once the white chocolate pumpkin scones have finished baking and have cooled to the touch (about 10 minutes); transfer them to a cooling rack. Fill a piping bag (or a zip top bag) with the glaze and snip off the piping end. Drizzle the cinnamon-maple glaze over the scones. If you like runny glaze, pipe the glaze while the scones are still warm. If you want your glaze to hold its shape, pipe onto the scones after they’ve cooled completely. No matter how, or when, you pipe, they’ll taste amazing. Pile them high, stuff your face full and get back to DIY’ing!!! Pin this recipe for later and I promise to show you an updated pic of our beautiful (hopefully) new dining room next week! Keeping your ingredients as cold as possible, and not overworking the dough, is the key to the flakiest scones ever. Preheat your oven to 400°F. Line a baking sheet with parchment paper or a silicone mat. In a large mixing bowl, add the flour, sugar, 1st quantity of salt, baking powder, and the Pumpkin Spice Blend. Whisk to combine well. Set aside, or refrigerate to keep cold. 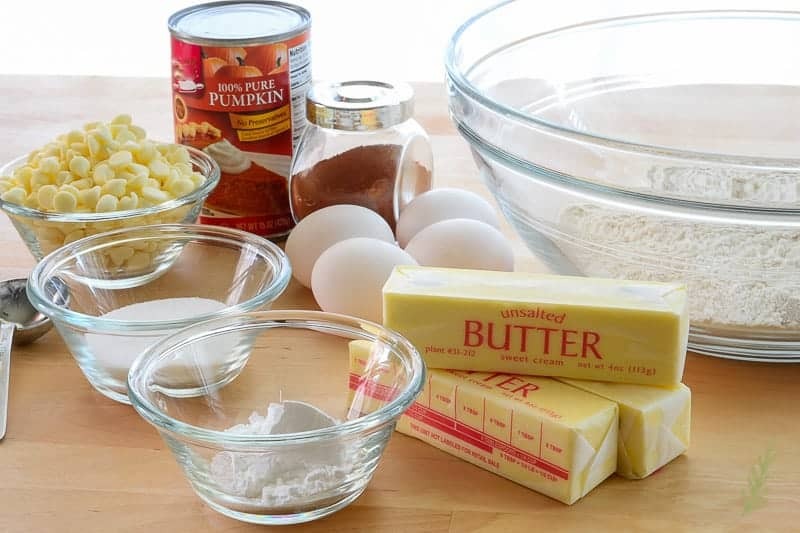 In a separate mixing bowl, whisk together the pureed pumpkin, whipping cream, and the eggs. Keep cold in the fridge until ready to combine with the dry ingredients. 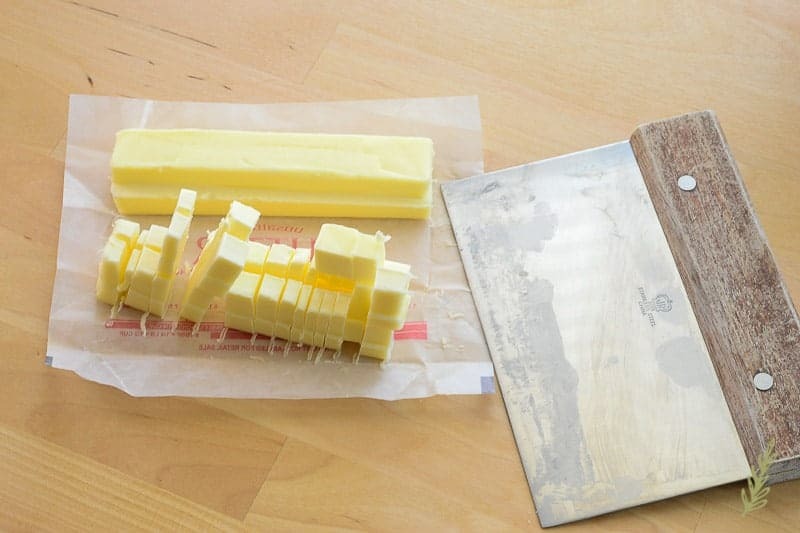 Add the diced butter to the flour mixture and cut together using your fingers, or a pastry cutter. Cut in just until the butter resembles peas. Add the pumpkin mixture and mix, just until the dough comes together. Gently fold in the white chocolate chips. 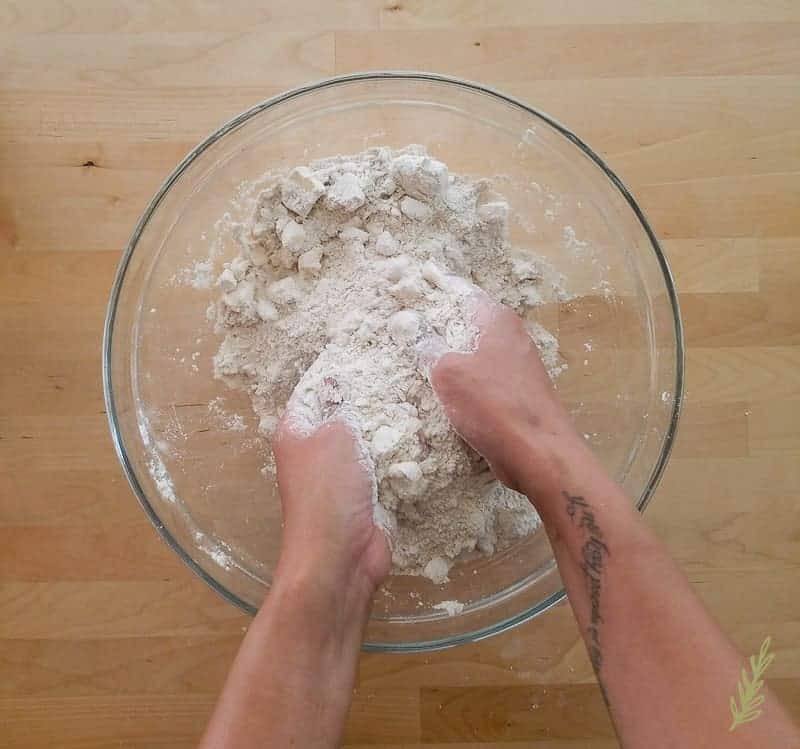 Turn the dough out onto a generously floured surface. 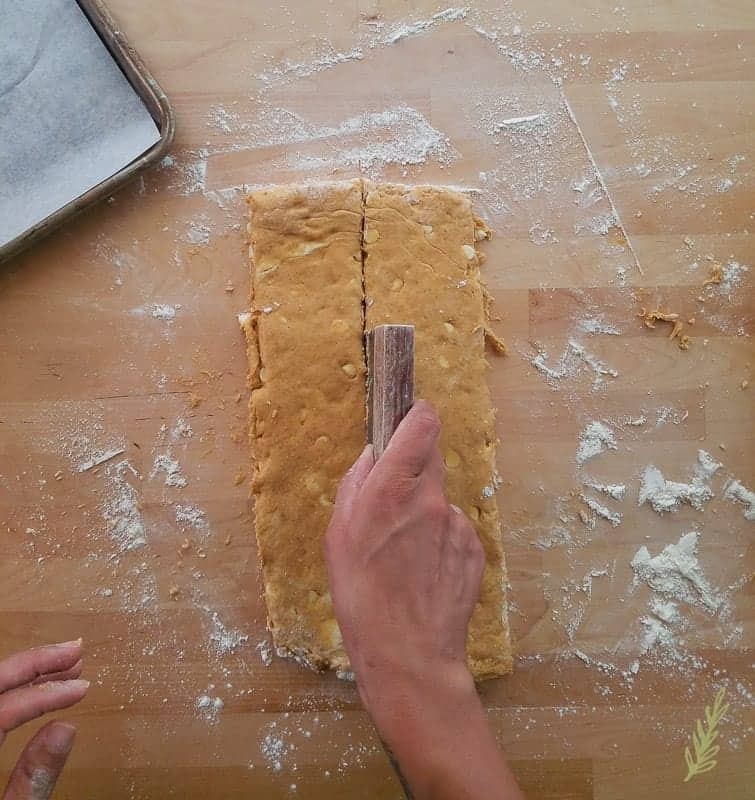 Roll into a 9"x13"x1/2" rectangle using a rolling pin. Cut the dough into thirds, lengthwise; then cut the dough into triangles of equal size. Place the scones onto the sheet pan. If the dough has become too warm, refrigerate for at least 30 minutes before baking. Bake for 15-18 minutes, or until the white chocolate chips, and the scones' tops, begin to turn a deep golden brown. While the scones are baking prepare the glaze by combining the cream cheese, ground cinnamon, maple syrup, sugar, and salt in a mixing bowl. Using an electric mixer, whip until smooth. Fill a piping bag with this glaze and set aside. Once the scones have finished baking, remove them to a cooling rack until cool to the touch- about 10 minutes. Glaze generously with cinnamon-maple glaze and enjoy! 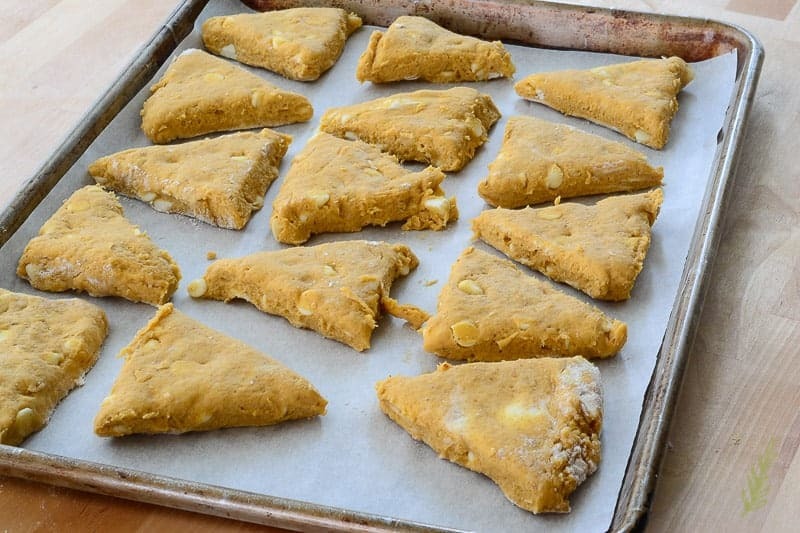 To freeze the scones, simply place the pan with the cut scone triangles into your freezer for 4-8 hours. Once the scones are frozen solid, transfer them to a freezer storage bag. When ready to use, simply remove your desired amount and bake as instructed. These scones freeze for up to two months. These scones belong in a magazine. You are an artist! I can’t wait to try them! Aw, Jennifer! That means so much to me! I’m glad you like the post! I guess I’m a little like Hector:) I love white chocolate and especially pumpkin. Sounds like a match made in heaven. The maple seems like a perfect compliment. They all work perfectly together. I guess I’m the oddball who isn’t a huge fan. I try though! These are beautiful!! Wow! What a thing of beauty! Also, yum yum yum! Yum!! I’ve been craving scones, yours look amazing! Thanks, Jenna! Scones are the best, aren’t they? These look so good! I would have never thought of combing some of these things but the look delicious! Oh Wow! Just love how simple and easy it is make this. Thanks for this awesome recipe! It’s my pleasure, Madhu! Thanks for stopping by! These look amazing! I love pumpkin but not so much on the white chocolate, but if you can overcome that so can I! More than that, though, I LOVE your writing style and your pics. 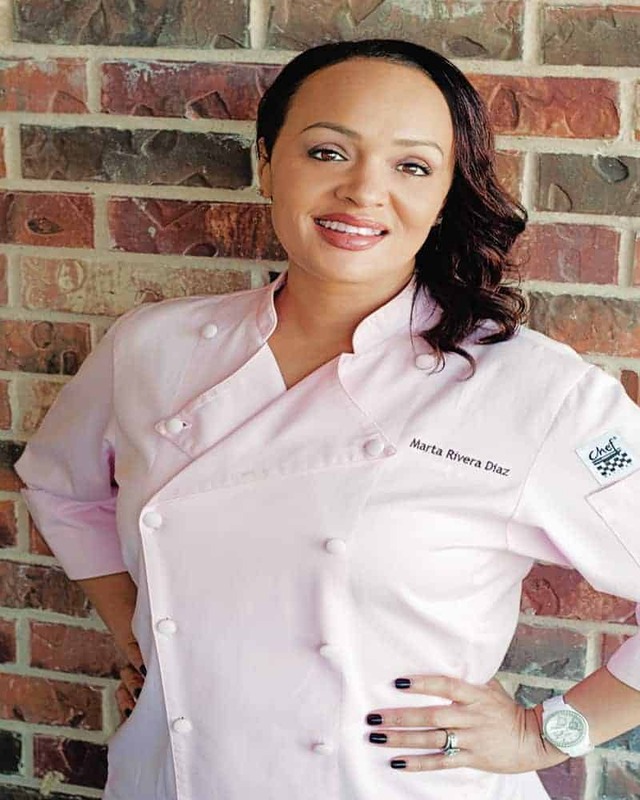 Great engaging recipe post! I’ll keep coming back to see what else you’re up to here. Thanks so much Meaghan! Yes, If I can actually enjoy both the white chocolate and the pumpkin, I have no doubt you will enjoy them as well. We’ll consider it our “immersion therapy”! Haha love everything about this post. You’re “voice” in this post is hilarious. You had me cracking up! And I feel the same about white chocolate – no thanks. But my husband is crazy about the stuff so I think I’m going to have to use this recipe as bribery too! I think it’s a Pastry Chef thing. We know it’s bootleg chocolate and they think it’s the best thing since sliced bread. LOL! Thanks for stopping by! These sound AND look so delish! 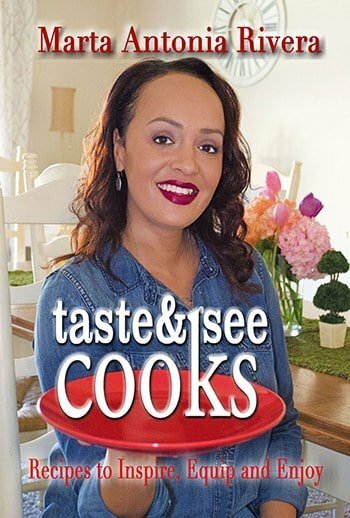 Definitely want to give them a try for Thanksgiving! For sure, Ashley! I’d love to wake up to these on Thanksgiving morning! I don’t think we need to say, “No!” Let’s enjoy them! LOL!